We have given this site a four bottle rating. This is because whilst its standards are not as high (or its prices) as some of the other Chateaux options, it is much closer to the track. Those wanting a different experience from being trackside, car clubs, late bookers. Small and intimate location away from the action on the main campsites. If you want to drive down with minimum equipment and want a quiet spot, or if you have kids or are getting past the partying into the wee small hours, this could well be for you. We'd say that this is probably ideal if you want somewhere civilised and under proper control. It is close, but not too close, safe, and quiet so you get a good sleep, with minimal effort required. On site hook ups, wi-fi, satellite TV and catering. Not at the track, but very close to it by bike or car. 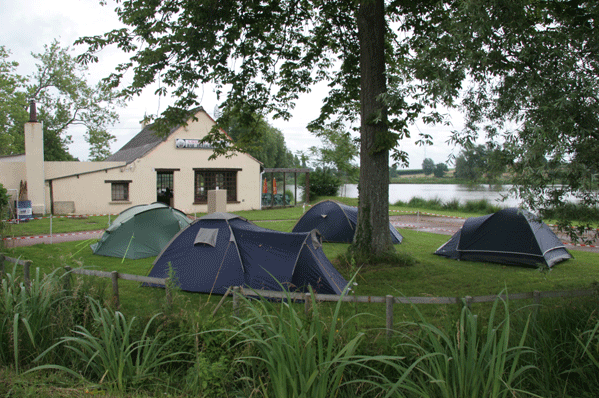 Simple camping, civilised but not luxury. Relaxed crowd. On site catering and bar. Some staffing issues in past and unpredictability of last minute arrivals. You are paying for on site catering and minibus transfers even if you don't use them. 14km south of Arnage. 20 minutes drive without traffic. The facilities consist of a shower wagon with 4 showers, basic but working with hot water. A further chalet with three more showers and three basins again basic with hot water. A further chalet with four traps for the chaps, again basic but cleaned and stocked with toilet paper regularly. The men's urinals are on the outside of the toilet block surrounded by fencing al fresco style. The ladies' showers and toilets are in the main building and no dramas were heard of. 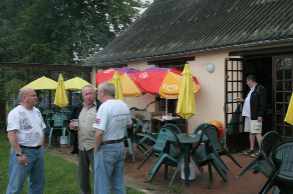 The main building has a kitchen at the rear, small bar and seating for around 40 people and has a flat screen TV with Sky. Outside there is a covered terrace with further seating for around 30 more people and across the way there is a marquee with seating for 40-50 more. Meals: Brekkie was full English where we had to queue as the eggs were cooked 7 at a time. Breakfast was OK and there was toast, tea, coffee, oj etc. Evening meal was OK and worked on a raffle ticket per group so you were in the queue. We had to pay 7.50€ for breakfast on the first morning which I thought was at the top end. There are free minibuses laid on to shuttle between the campsite and the circuit. These only started on Thursday lunchtime which left us sweating a bit to make the Beermountain AGM. In the end though we were dropped by Maison Blanche and were there in plenty of time. We were told that a former manager of theirs had left Bounty and taken some paperwork with him including the papers for the hire buses and parking permits which they had only found out about at the last minute. This was obviously not the plan but they sorted the buses by the time most of the punters arrived from Friday morning onwards. They then had an added problem of two of their drivers letting them down at the last minute and Management ended up having to drive rather than stay at base to run / organise everything. Two other chaps (friends and anglers) stepped in to drive the buses but did not know their way around Le Mans. They also had a young lad who stepped in to help in the bar and take calls from campers wanting to be picked up etc. He did a grand job in totally alien circumstances to him. Generally over the weekend, the shuttle pick-ups were erratic but this was because they were trying to appease everyone. It would be more sensible if they only picked up from 3 or 4 designated points. They can drop wherever but by sticking to designated pick up points schedules will be easier to follow. Hopefully this will be implemented next year. This year there was a late booking by a Eurosport/Nissan nemo group about 30 strong who had apparently booked last minute making numbers up to around 180. They were a lively bunch being media types. I think the fact that coupled with the ex manager leaving them in the lurch and the sudden influx of the Eurosport group took them to breaking point but they managed to pull it off. All in all Bounty is OK but primarily it is a fishing venue cashing in on the 24 hrs. They relied a lot on friends and regular anglers to help out for the week. They need to put in place a plan with reliable, cheery staff and drivers who know their way around Le Mans. They will need to update their facilities as although they are OK, if left they will degrade and struggle to cope. The camping areas are OK and everyone had plenty of room but you can't cater for the weather, The car park is good, flat and on hard ground. Peace of mind is in the overall security of the site. Wi-fi is more of a domestic set up and struggled all weekend crashing regularly. In the end I gave up trying. Would I go back next year - Need to speak with the team but Yes. Is it value for money - Reasonable compared to similar châteaux offering the same type of packages although the additional breakfast is expensive. Fatfish motorsport has exclusive use of Bounty lakes, a popular retreat for seasoned race goers for both LM 24, LM 24 Classic and LM Moto GP. You can be assured of a warm reception from our experienced team and the opportunity to meet and socialise with like minded race enthusiasts. 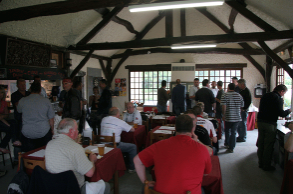 Located just off the D338 4km south of village of Mulsanne we are well placed for those who wish to enjoy the Le Mans events at their own pace without the hassle and excesses of "on circuit" camping. Bounty is far enough away to chill out yet close enough to join the action.